The cities of San Francisco and San Jose are merging their two municipal Wi-Fi networks; at least on the virtual level. The two cities are using a new technology — Hotspot 2.0 — to let smartphones automatically connect and roam between their two networks as well as provide a layer of security on what wouldn’t normally be available in wide-open public hotspots. Hotspot 2.0 is a bit of a strange technology to highlight because when it’s working you never notice anything happening. 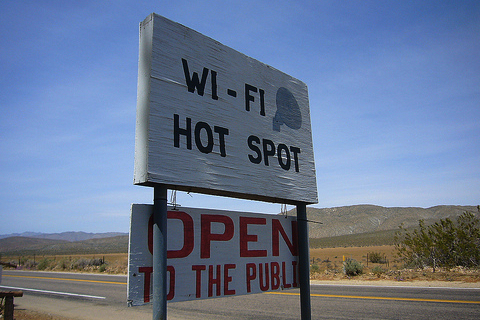 The public Wi-Fi network behaves very much like the cellular network and your phone automatically connects to the nearest hotspot access point with a secure WPA2 connection – just as it would connect to your home router. According to San Francisco Department of Technology CTO Flavio Aggio, security is the main reason why San Francisco decided to upgrade its Ruckus Wireless(s rkus) access points to Hotspot 2.0. SF wants its public hotspot network — which now covers Market Street, the city’s main commercial corridor, but will soon expand to public parks — to become a key component of its municipal infrastructure, useful for businesses, consumers and city workers. That demands encrypted connections, he said. But Aggio said he certainly isn’t blind to Hotspot 2.0’s potential for forming intercity networks. San Francisco and San Jose are connecting their networks today, but Aggio said he is already in talks with other cities to include their municipal Wi-Fi grids in broader roaming agreements. Right now, only iPhone and iPad users have access to the joint networks, since iOS fully supports the automatic configuration of Hotspot 2.0 settings in the phone’s Passpoint client, though many Android devices will gain that capability later this year, Aggio said. iPhone users that log into San Francisco or San Jose’s network for the first time will be greeted by a splash page inviting them to download Passpoint settings. Once those initial settings are saved, the phone will automatically connect to any of either city’s hotspots. The Samsung Galaxy S4 has Passpoint capability. Does that make it work with Hotspot 2.0? Hi Michael, there are a lot of phones that have Passpoint clients like the GS4 and GS5. The issue Aggio is talking about is automatic configuration from the access point. You can change your settings manually, but you can’t download them into the phone when you connect for the first time. Apple supports Over The Air (OTA) provisioning of the HS2.0 credential using their mobileconfig profile framework. This allows Ruckus to push a TTLS username/password credential and all the parameters to a supported Apple client from a provisioning portal. Today there is no mechanism to do this to an Android client. Samsung is apparently working on such a capability.